Our team conducted our school outreach program in 14 schools throughout Manila. Relevant issues students and teachers struggle with were addressed, such as drugs, alcohol, depression, suicide, eating disorders, homosexuality, and others. After a clear presentation of the Gospel was proclaimed before these thousands of youth and young adults, over 9,400 of them decided to repent of their sins and publicly make a commitment to Jesus Christ! Due to the months of hard work by our native Filipino staff and assistants, we had numerous local churches, pastors, organizations, and individual “disciplers” in place to begin the contacting, follow-up, and discipleship of those who decided for Jesus Christ! I regret to report a typhoon hit Manila the day of our Leadership Development Conference. Sadly, two people died and several were missing. Our prayers went out to the families of those lost in the typhoon floods. In spite of this tragedy, approximately 700 pastors, church leaders, and ministry-minded Christians attended our conference, some traveling up to 8 hours through risky weather. After my final message on “Revival & Spiritual Awakening,” over 225 church leaders came forward to rededicate their lives and ministries to Christ! Plus, 3 people accepted Jesus Christ! An important component of this project was “Celebrate Recovery (CR),” which is a group program ministry that helps people work through life “hurts, hang-ups, and habits” by the power of Jesus Christ. Our project team consisted of several CR members from our home church, Houston’s First Baptist Church. As a result of our conference, over 200 churches throughout Manila signed up to start CR ministries with the help of the native Manila CR coordinator. In addition, our team conducted services in 6 churches where we testified and preached the Good News of Jesus Christ! We gave out 100 Bibles to those who did not own a Bible and distributed 50,000 salvation tracts to students and teachers in the schools and those we reached in the churches. We gave tracts to each person who attended our conference and equipped them in how to effectively and strategically use them. Our Director of Asia Ministries recruited 80 people to volunteer at our Leadership Development Conference, and one of these volunteers was a nurse available to help in case anyone became ill. This nurse was led to accept Jesus by our director and one of our volunteers! A teenager named James gave his life to Christ after one of our church events. His family is of a different faith, yet in spite of potential family disapproval, James decided to follow Jesus. He is now under the guidance of the church’s pastor. The pastor of a new church who attended our conference had lost his 11-year-old son last year right before the first Sunday service of the new church. He attended our conference and said he was encouraged by my message on “Suffering,” and that he is going to continue forward in his ministry. 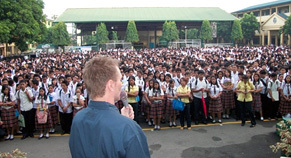 These are just some of the countless lives that were touched by Jesus Christ in our Manila, Philippines Project. It is because of our ministry partners like you that such testimonies were made possible…thank you for your prayers and support!